..Last December 29, 2014, the Infiltration Gallery was damaged during the Tropical Storm Seniang. The filter media of the said gallery as well as the four manholes for maintenance purposes were clogged with sand, stones, sediments and other flood materials.. The main source of Butuan City Water District’s (BCWD) water supply is theTaguiboRiver, a part of the Taguibo River Watershed Forest Reserve. An Infiltration Gallery, which is an underground gallery or tunnel with perforated pipes located five (5) meters below theTaguiboRiver, serves as the extraction point. This is where water is collected through intervening sand and gravel filters going to the transmission line. During normal operation, water requirement of 1,200 cu.m. per hour for the more than 38,000 water connections is very much satisfied as the Infiltration Gallery can supply 1,400 cu.m. per hour. Although during rainy days, we shut off our Infiltration Gallery because of high water turbidity level as we lack the facilities to treat high water turbidity level. That is why we have engaged in the Public Private Partnership project, which is now undergoing. Because of the great devastation in the watershed area, flooding can occur frequently and with a very high intensity as manifested during Tropical Storm Seniang. The extent of said devastation can be attributed to the different illegal activities conducted in 2008-2012, where individuals conducted illegal road construction, Manganese mining and timber poaching. The damage caused by the various illegal activities has a long term effect on the watershed including the water quality and quantity of the Taguibo River. View Pictures here. Even though efforts were made to restore the Taguibo Watershed to its healthy state, it will still take a number of years before it can be felt. As such, the Taguibo Watershed is now vulnerable to any type of natural or man-made calamities. The resiliency of the watershed to these calamities is now dwindling as manifested by the frequent occurrence of flashflood and drought during a long dry spell. Last December 29, 2014, the Infiltration Gallery was damaged during the Tropical Storm Seniang. The filter media of the said gallery as well as the four manholes for maintenance purposes were clogged with sand, stones, sediments and other flood materials thereby making it impossible for the water to pass through the transmission line. 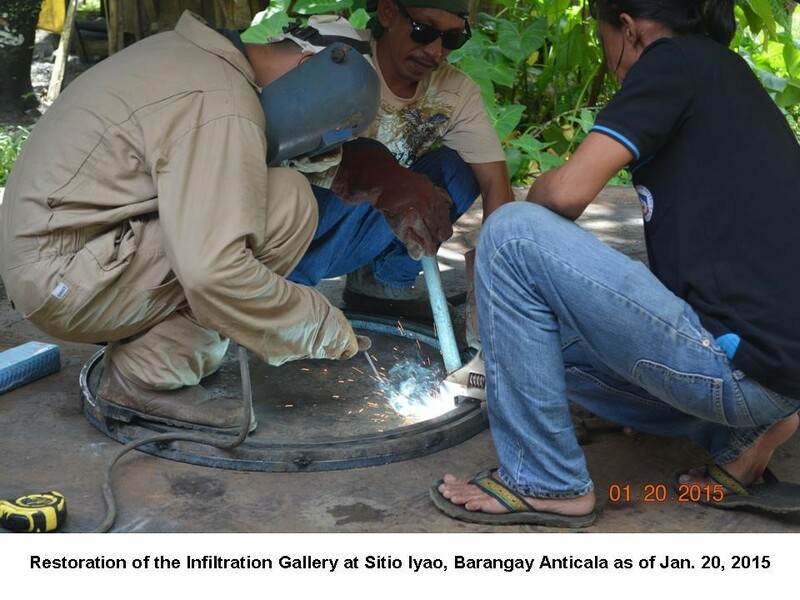 Due to the damage of the Infiltration Gallery in Sitio Iyao, Barangay Anticala, there is no water available for the seven (7) Automatic Microfiber Filters to process. 1. Water Rationing through valving, tankers and containers. View Pictures here. Two days after the storm, with the help of the City Government and Bureau of Fire Protection, we started rationing. We also started rationing through valving to direct water produced by the five (5) pumping stations to a certain portion of the service area, with four (4) to six (6) hours per area. We borrowed tankers from Equiparco, Chinese Chamber of Commerce and ADFIL for utilization during rationing through tankers. We also purchased containers for rationing through containers (these containers are filled with water distributed to consumers in exchange of their empty containers). 2. An alternative source was provided by the Local Water Utilities Administration. The alternative source is located in the diversion road of Barangay Bonbon near the police detachment. Two Mobile Water Treatment Facilities are operated by LWUA personnel where concessionaires of BCWD with vehicles can fetch water from 5:00 am – 10:00 p.m.
3. Other neighboring water districts such as Bayugan, Buenavista and Gingoog Water District also assisted BCWD by lending additional equipment needed for the restoration and rehabilitation of damaged facilities. 4. Non-Government Organizations, collectively known as Caraga Cares, have also been assisting BCWD in rationing water to the Barangays. Pump Station Number 10 has been activated using a generator as power source. Preparatory activities have been done, and expected to be operational by next week. The manholes in the Infiltration Gallery was 100% filled with eroded materials. Declogging activities are now on-going. We are doubling our efforts to fast tract the rehabilitation works. If the weather permits, we are expecting this will be completed in two weeks time.